For decades, adults with crooked teeth have avoided getting them straightened simply because they didn’t want to put up with the look and hassle of metal braces. 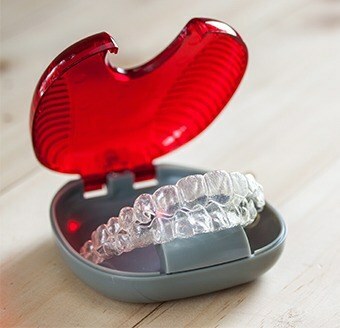 Thankfully, modern dentistry has come up with a solution that was specifically designed with them in mind: Invisalign. This system can correct crooked and crowded teeth without affecting someone’s day-to-day appearance, providing a discreet treatment that delivers beautiful results in record time. Is Invisalign the treatment you have been waiting for? To find out, give us a call today. Why Choose Fulshear Dental for Invisalign Clear Aligners? Invisalign works using the same basic principles as other orthodontic treatments: a consistent force is applied to the teeth to make them slowly shift into the ideal positions. Instead of brackets and wires, however, Invisalign uses a progressive series of clear plastic aligners to accomplish this. Each aligner is custom-made based on an impression of a patient’s smile in order to ensure a comfortable fit and effective treatment. After wearing each tray for 20-22 hours a day for around two weeks before switching to the next one in the set, a patient should see a beautifully straight smile in the mirror. 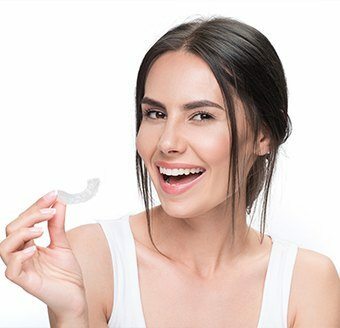 Practically Invisible: Everyone knows if you have braces, but most people won’t even notice your Invisalign aligners unless you tell them because they are thin, lightweight, and very see-through. Unmatched Comfort: Instead of metal wires and brackets poking your mouth, Invisalign is made of smooth plastic that is specially-shaped for your unique smile. Flexibility: Need to eat or brush your teeth? Just take your aligners off until you’re done. You definitely can’t do that with braces! Speed: The average treatment time for Invisalign is 12-18 months, which is just a fraction of the 24-36 months most traditional orthodontic treatments require. 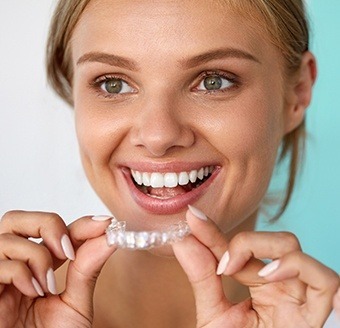 We only recommend Invisalign for patients 18 and up because younger patients have teeth and jaws that need more time to grow, and it takes a bit of self-discipline to consistently wear the aligners as well. Otherwise, this treatment can help practically anyone hoping to correct their crooked, crowded, and gapped teeth. To learn more about Invisalign and get started on the path to a straighter smile, contact us today.